15.67" x 8.58" x 17.32"
Airflow is correct on this case, bottom to top. 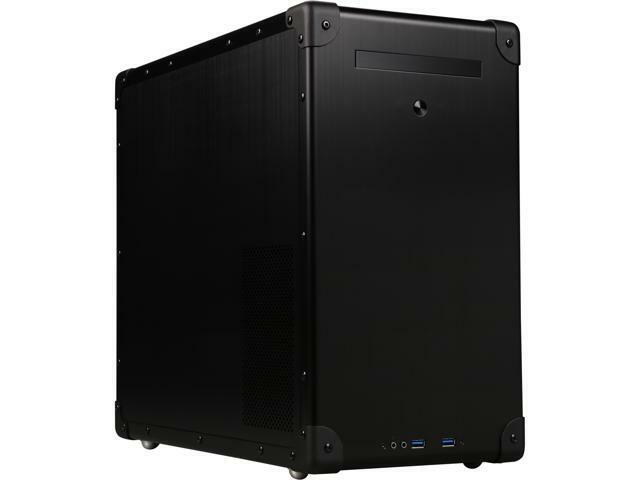 the corners of the case are reinforced with rounded aluminum pieces. The side doors do not have any permanent way of holding them closed like a lock or screws. They are only held in place by a ball and socket design where the ball is a steel pin on the door and the socket is a plastic clip in the case. The doors seem to be held in with enough force though. The side covers are removed with a weird slider that just pushes on the inside of the door. I removed them in my build and I just push my finger though the coolant hole to open the door. The main handle on the top doesn't have much reinforcements around where it attaches to the top of the case. I don't have any problems at the time of install but this might be a weak point with heavy cases. There is enough room for a fill sized CD drive, I have no clue why they used the slim type. The I.O. side (back) of the case is not recessed to save on the case size but it does expose your hardware to potential damage. Other Thoughts: For what this case is, it is amazing! I managed to fit a full sized atx motherboard with TWO GTX 980Ti graphics cards in SLI. And with the Cooler Master Hyper 212 EVO CPU cooler the top of it is millimeters away from the side panel. For all that I've mentioned in the negative section I still really love this case, there is room for improvement but I still give it a 9/10!